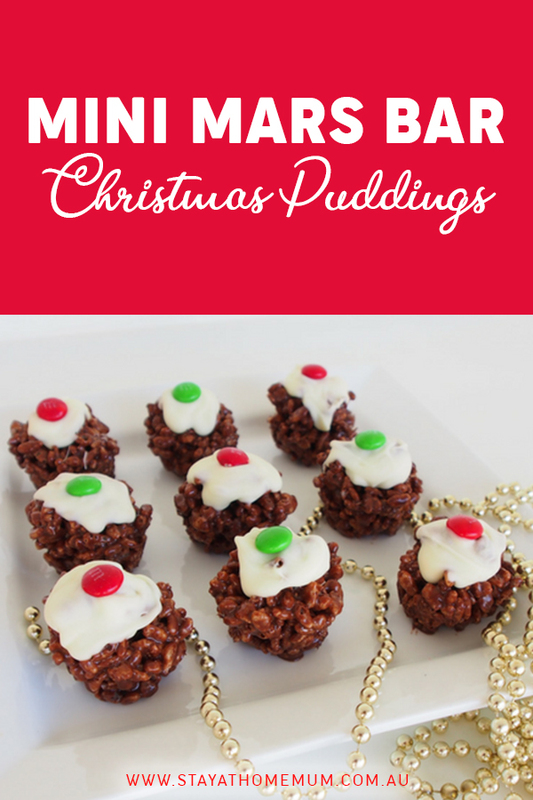 Mini Mars Bar Christmas PuddingsGreat recipe for the kids to make this Christmas!! Mini Mars Bar Christmas Puddings contains everything kids love. Chocolate (Mars Bars), Rice Bubbles and oh more chocolate. It’s a novel idea for Christmas dessert! Amp up the flavour in your Christmas puddings with this all-time favourite chocolate! The great thing with this simple recipe is that you can make them in advance and freeze them for later. Or just eat them straight out of the freezer (they are AMAZING cold). Spray a little canola spray into 2 x 12 cup mini-muffin trays. Melt the Mars Bars, cream and cocoa in a glass bowl over simmering water. The bowl should not touch water. Stir the mixture until smooth. Put the Rice Bubbles in a separate large bowl, pour in the chocolate mixture and stir until well mixed. Spoon the mixture into the muffins tray and press down gently. Refrigerate for 2 hours and turn out onto a tray to decorate. Melt white chocolate add one teaspoon to the top of each mars bar pudding. Place one M&M on each pudding. Now try not to eat them all! Mini Mars Bar Christmas Puddings are suitable for freezing for up to 2 months otherwise keep in an airtight container in the fridge for up to 1 week.